Vibrant and strong are the underlying messages of a painting presented to South Texas College and dedicated to its students. During a regularly scheduled board meeting held Jan. 29, Laura Warren, owner and architect of The Warren Group Architects Inc. donated an original Fernando Giron painting titled “Perception 5” to South Texas College. The vibrant acrylic on canvas 60” x 60” painting is dedicated to all the students at South Texas College working towards creating a better future. Warren said the painting reminded her of the students at South Texas College breaking barriers and making a difference in spite of obstacles. STC board members appreciative of the gift said the painting would represent the college well. 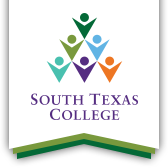 “On behalf of the college we want to thank Laura Warren so much for everything she does and we are very thankful for this painting,” said South Texas College Chairman of the Board Paul R. Rodriguez. The painting will be displayed in the Student Union Building on the STC Pecan Campus, a building also designed by Warren and her team as part of the 2013 bond construction program.